Walt Disney World on Parade was the moniker given to the 5,000 participant rolling spectacle that was part of the dedication events for Walt Disney World and the Magic Kingdom. We’ve talked previously about the 1,076 member marching band led by Meredith Wilson, but today I want to stop for just a moment and admire the role of the big cheese himself, Mickey Mouse, in the parade. In almost every parade, Mickey is seen in one of two positions, the very first or very last float. He has been a conductor, sorcerer, other sorts of conjurers and, as is the case in the October 25, 1971 Walt Disney World on Parade, the band leader. Notice how high Mickey is and how small he looks compared to the drum? 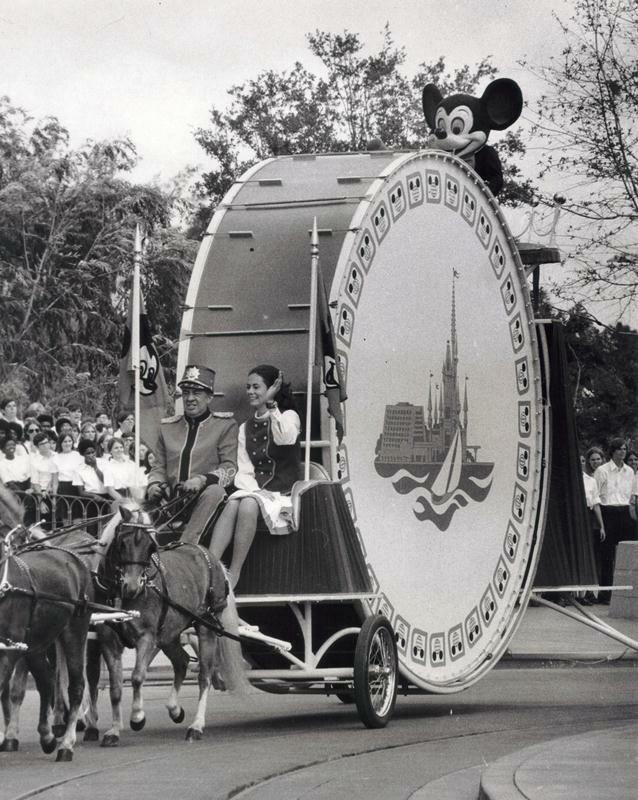 As it turns out, Mickey was at the front of the parade on that balmy Monday in 1971, which also happened to be Veterans Day, banging along on a bass drum that was the largest in the world at the time. The little thing I notice from this photograph is the simple and gorgeous iconography set upon the sides of the drum. In the background he castle stretches skyward, while a monorail whooshes from within the belly of the Contemporary on its way to the Magic Kingdom, and a sailboat races along in the choppy waves of the foreground. It is succinct and simple and provides just a taste of all that the Vacation Kingdom has to offer. Then, of course, there is the capital letter D wrapped around the global Mickey symbol that was the insignia of Walt Disney World for so many years. There are performers in the background and we could also talk about the horses pulling this mighty drum, but perhaps we should stop here and let Mickey and the drum enjoy their day in the spotlight. Ryan, thanks for sharing this wonderful photo. This is the first I've seen this drum. I love the imagery and the use of the Big D, Globe head logo around the edge of the drum.